A stainless steel staircase lends a sense of modern sophistication and style to a residential or commercial space. 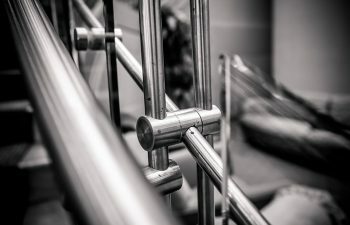 Both durable and aesthetically pleasing, our metal staircases are available in limitless designs and styles, and our innovative team is capable of bringing each unique vision to life. Stainless steel is highly versatile and can be paired with different design materials and elements for distinct styles. This week, we explore several popular stainless steel staircase pairings. 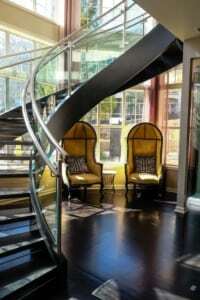 Our first featured glass and metal staircase offers open views and a sophisticated feel. This beautiful freestanding curve is constructed with open risers, enhancing the stair’s modern appeal. 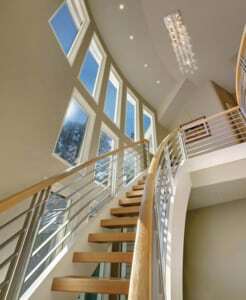 The beautifully crafted glass and steel railing system are the perfect fit, complementing the stair’s arc and the room’s excellent lighting. Sleek and modern, glass and metal are a natural fit, but stainless steel can also be perfectly paired with wood for a unique design flair. The project below includes wooden open rise treads and a wooden railing with stainless steel. The combination of horizontal and vertical bars create an interesting pattern that takes the wooden stair to a new level. For customers who love the sleek combination of wood and stainless steel, another unique design option is our Avant Series. Avant transforms functional railing fittings into unique design accents, creating beautiful contemporary wood and stainless steel handrail systems. Like glass and wood, cable rail can be paired with stainless steel for a unique, modern railing system. 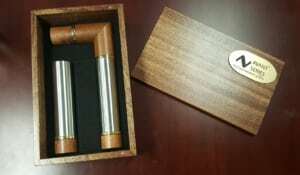 The photo below illustrates cable rail and steel’s minimalist, open style. This contemporary staircase and railing system create a perfect fit for this modern residence. 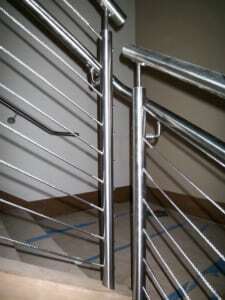 Next, we take a closer look at a stainless steel and cable rail combination. This photo highlights the perfectly crafted fittings and joints which bring the elements together into a seamless and cohesive system. We are proud to deliver quality products with cohesive design and flawless fit and finish. Visit our commercial project gallery for additional details and pictures of our exquisite projects. From inspiration to installation our team is committed to designing and building the highest quality metal staircase for your needs. Our reputation speaks for itself, and client satisfaction is our highest priority. Contact us today to get started on your next commercial staircase project.